‘Tis the season for holiday lights, parades, and all around holiday fun. Looking for something fun to do in Indianapolis, IN with friends and family in the upcoming weeks? There is way too many to list them all, but, here is a sampling of some local favorites to help keep your days merry and bright. The Nutcracker. For just one night only, the Moscow Ballet’s Great Russian Nutcracker will be coming to Indianapolis, IN on November 28th. Whimsical and imaginative storytelling blends with the richness of Russian classical dance to make this particular Nutcracker a unique holiday treat not to be missed! Murat Theatre, show time 3pm. Cirque Dreams Holidaze. Cirque Dreams: Holidaze has been entertaining its fans, young and old, for seven years now! And now you can experience the magic for yourself when the production hits the Murat Theatre in Indianapolis, IN, showing from Dec 15th – Dec 20th . Circle of Lights. Circle of Lights is the world’s largest Christmas tree, complete with nearly 5,000 lights and 52 garland strands streaming from Indy’s beloved 242-foot tall Soldiers and Sailors Monument. 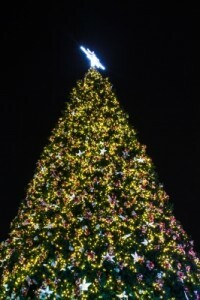 This tree has been named by Travelocity as one of the top five must-see Christmas trees in the nation. 1 Monument Circle, Indianapolis, IN November 27th – January 11th. I hope your holidays are merry and bright and that you get to experience all that Indianapolis has to offer this time of year. If you are visiting us in hopes of buying a Indianapolis, IN home and need a local expert to help show you around please contact an Indianapolis, IN real estate agent. We’d be happy to assist you in any way possible. Happy Holidays to you and yours!